Cycling Ulster wish to extend our condolences to the friends and family of Alan Towell after his sudden passing at the weekend. Please see statement from Banbridge CC below. The members of Banbridge Cycling Club are saddened and in shock at the loss of their close friend, club mate and stalwart of the club Alan Towell who passed away suddenly on Sunday. 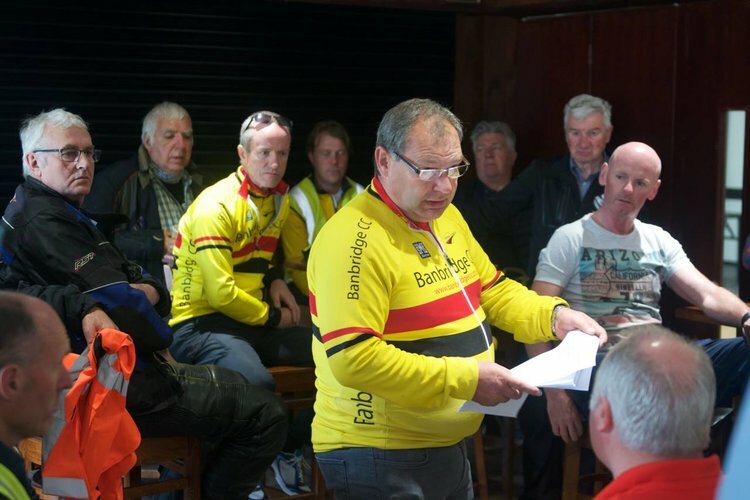 Alan, who joined Banbridge Cycling Club in 1973 as a schoolboy cyclist, remained at the heart of the club and local cycling scene as an active volunteer for over 40 years. His passing will come as a shock to many local cyclists and supporters who are used to seeing Alan organising weekly local events and assisting with national cycling events as Chief Marshal and Safety Officer. As a cyclist Alan competed for the club until 1987. During those years he held the titles of Ulster Junior Road Race Champion and represented Northern Ireland at the International Junior Tour of Ireland. As a senior rider he was ranked top 10 best all-rounder in NI, and again represented NI internationally as a senior, fulfilling the potential shown as one of the provinces top junior riders. Among Alan’s most cherished highlights as a rider was his contribution as part of the winning Banbridge CC team at the 1982 NI Road Race Championships alongside Olympians Seamus Downey, Noel Teggart and Commonwelath Games cyclist David McCall, perhaps a sign of his enthusiasm and commitment to assisting his fellow club and teammates. As a volunteer Alan followed on in the footsteps of his late father, Ivan Towell, a renowned volunteer for Banbridge CC and also the Northern Ireland Cycling Federation as an Executive member. As a teenager Alan assisted his father with the running of local races; preparing rider race packs, course preparation and marshaling. Racing became the focus over next few years for Alan as a junior and young senior competitor. It was during these racing years that Alan became the ‘go-to’ man within the racing team, providing transport to and from events, insisting the team travel together as a unit. This led onto Alan taking on the mantel as Team Manager on key events for the club such as the Tour of Ulster international stage race where he would look after and manage the riders. Alan also became involved with the Cooperation Ireland Maracycle from its inception in 1984, carrying out various duties including marshaling, managing feed stations and mechanical assistance for participants. He continued in this capacity for the duration of the event, being run until its final promotion in 2015. In recognition for his length of service to the event Alan was selected as part of a delegation panel in 2013 to represent the Event Organisation to meet with the HRH Queen Elizabeth & the President of Ireland, Michael D Higgins. Alan once again became heavily involved with assisting Banbridge CC promotions in 2008, quickly becoming a key resource for the club, and taking the lead as Club Event Race Secretary; responsible for the running and management of the weekly club league races – a role he fulfilled until 2018 when he also formed part of an organising committee for an interclub venture, bringing together local Banbridge based cycling clubs to promote a hugely successful interclub league which has attracted hundreds of competitors from the local area. Alongside the already demanding role of Club Event Race Secretary, Alan also became a key member of the Open Race Committee in 2010. In recognition for his ongoing services and contribution to Banbridge Cycling Club Alan was awarded the Belmont Cup as Club Person of the Year in 2015, and was due to receive a further award from Armagh, Banbridge & Craigavon Council’s Sports Awards next month in recognition for his lifetime’s services to sport. Banbridge CC members wish to convey their deepest sympathy to Alan’s dearest wife Angela, loving Daughters Felicity & Christina and the wider Towell family. A funeral service will take place on Wednesday, 30th January, at 2pm in Bann Rd Presbyterian Church, Dromore followed by interment at Dromore New Cemetery, Mound Rd, Dromore. Refreshments will be served in the Church hall following the service where everyone will be made welcome. Friends are welcome to call at the family home tonight (Monday) and Tuesday.